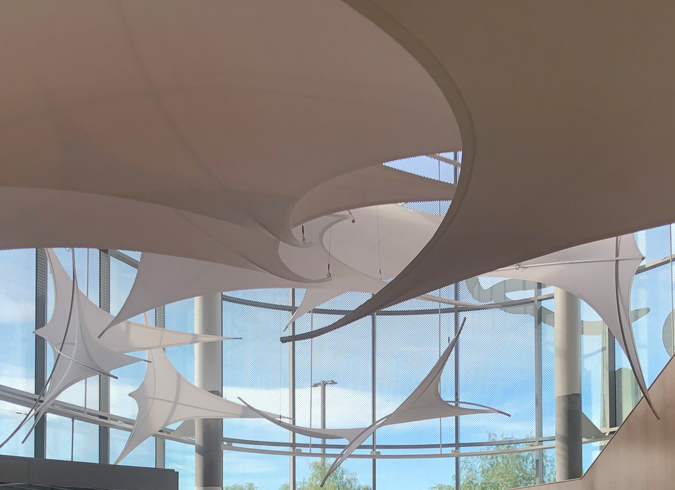 SmithGroup’s client selected a design featuring an array of Transformit FireFlys, a tension-fabric element from our Ready-made collections, for their wing-like form and ease of rigging (each piece can be hung from a single point). With an initial Transformit design in-hand, SmithGroup hired specialists in daylight simulation, Cool Shadow of the architectural design firm Loisos + Ubbelohde (L+U), to conduct a thermal comfort study of the atrium and approximate the interior shade the FireFly design would provide. Cool Shadow’s simulations indicated the design, with key adjustments—the addition of three FireFlys and construction with a double layer of fabric to permit less light penetration—would meet the interior shade objectives for the sculpture. Not only did Cool Shadow’s simulation of the sculpture give the architect and building owner the confidence to move forward with installation, once the FireFlys were installed, Cool Shadow conducted a follow-up study to compare their simulation to the sculpture's actual performance. It was spot on and, pun intended, pretty cool to see. "It’s great to see the similarities between the idea and the implementation,” remarked the construction project manager on the job for Quiring General. We couldn’t agree more. Here are a few side-by-side images from Cool Shadow's work, with the simulation on the left and the actual install on the right.